Bring a suit and a towel. Have you ever wondered what it's like to breathe underwater? If you want to find out but aren't quite ready to take the plunge into a certification course, Discover Scuba Diving will let you try scuba to see if you like it. While not an actual scuba certification, during the Discover Scuba Diving experience you'll learn how to use scuba equipment in shallow water and get a quick and easy introduction to what it takes to explore the underwater world. If you continue to the Open Water Certification, we will apply your $50 to the cost of the course. If you've always wanted to learn how to scuba dive, discover new adventures or simply see the wondrous world beneath the waves, this is where it starts. The PADI Open Water Diver course is the world's most popular scuba course, and has introduced millions of people to the adventurous diving lifestyle. At Freedom Scuba USA we can help you discover this lifesyle and get your PADI Open Water certification. Move up and experience real adventure with the PADI Advanced Open Water Diver course. As you step beyond the PADI Open Water Diver level, you make five dives and have the opportunity to try some of diving?s most rewarding and useful specialty activities, such as deep diving, digital underwater photography, wreck diving and much more. These skills make diving much more than underwater sightseeing. Plus, the Advanced Open Water Diver course takes you one step closer to Master Scuba Diver ? the ultimate non professional certification in recreational diving. Challenging and rewarding best describes the PADI Rescue Diver course. This course will expand your knowledge and experience level. Rescue Divers learn to look beyond themselves and consider the safety and well being of other divers. Although this course is challenging, it is a rewarding way to build your confidence. Rescue Diver training will prepare you to prevent problems and, if necessary, manage dive emergencies. Many divers say this is the best course they?ve ever taken. Just Pick Your 5 Speciaty Courses! Want it. Live it. Dive it. Join the best of the best in recreational scuba diving. Live the dive lifestyle and explore the underwater world like never before. Do it by becoming a PADI Master Scuba Diver ? a rating that puts you in a class of distinction. You earn it by diving it, writing your ticket to endless adventure through the experience and training that set you apart as a PADI Master Scuba Diver. Scuba diving is a way to explore the underwater world in new and different ways. PADI Specialty Diver courses teach you new techniques and give you the tools to enhance your exploration. You can take all your desired specialty courses with us. You can also do the eLearning portion of the course on line, and get on the boat to do the dives with our Experienced PADI Staff. Contact Freedom Scuba USA for information on this program. Freedom Scuba USA offers Internships to qualified personnel; in the fields of Scuba and Boat Deck hands. Please contact us for more information. Please Fill out following New Student Form if you are interested in taking a course with Freedom Scuba USA. We will contact you with selected course availability. There is nothing like breathing underwater for the very first time. It takes a little getting used to - after all, human beings weren't designed to do that - but after a few minutes of awestruck wonder, most participants realize how easy scuba diving really is. The biggest challenge instructors have with the Discover Scuba Diving program is not coaxing participants into the water, but coaxing them out when the program is over. The fun part? It's all fun! 1) Learn what wearing scuba equipment feels like and how easy it is to move around underwater while wearing it. 3) Learn some basic skills and safety rules that will carry over to your full scuba certification course when you take the next step. All the equipment you will need is included! You'll use all the basic scuba gear including a mask, snorkel and fins, a buoyancy compensating jacket that also carries your scuba tank, a scuba regulator to breathe from and instrumentation to monitor depth and air supply. You must be at least 10-years old. Adults are welcome, too! This is what it's all about, diving. You develop basic scuba skills in a pool. Here you'll learn everything from setting up your gear to how to easily get water out of your mask without surfacing. You'll also practice some emergency skills, like sharing air, just in case. Plus, you may play some games, make new friends and have a great time. There are five confined water dives, with each building upon the previous. Over the course of these five dives, you attain the skills you need to dive in open water. After your confined water dives, you and the new friends you've made continue learning during four open water dives with your PADI Instructor at a dive site. This is where you have fun putting it all together and fully experience the underwater adventure at the beginner level, of course. Freedom Scuba conducts these open water dives on the wreck of the Keystorm. Standard Class Sizes: 2 to 3 students maximum. - Use of facility equipment (BCD/Air/Wet Suit/Weights/Regulator) for duration of class. eLearners do not buy books but must register through www.PADI.com. Coach exploring the bow of the Keystorm with an OPEN WATER STUDENT. With your PADI Instructor, you complete the deep and underwater navigation Adventure Dives. These dives boost your confidence as you build these foundational skills. Then, you choose three additional dives from more than 15 Adventure Dives to complete your course. You can go diving at night, check out the local wrecks in the area or even fly through the ocean on a diver propulsion vehicle ? all during your PADI Advanced Open Water Diver course (available options may vary; inquire ahead for details). With the PADI Master Scuba Diver rating, you've reached the highest non professional level in the PADI System of diver education. It means that you?ve acquired significant training and experience in a variety of dive environments. PADI Rescue Diver or Junior Rescue Diver (or qualifying certification from another training organization), 12 years old, five PADI Specialty Diver certifications. Costs: $675.00 per person + $327.00 Dive Master Materials, + application fee when course is completed. 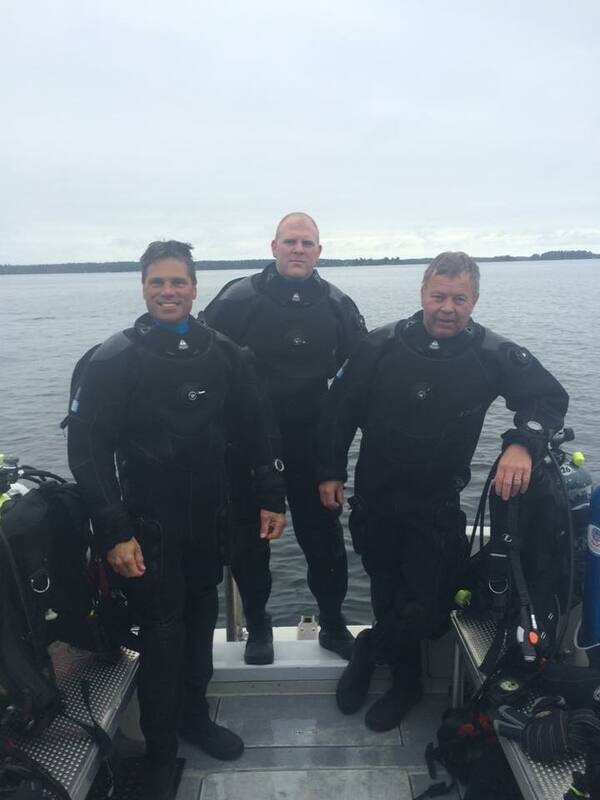 The three finest Divemasters on the St. Lawrence. To supplement the PADI diver training program that Freedom Scuba can offer, we are also proud to offer continuing education with the following Specialty Courses. Specialty Course Cost is $289 per Course. Equipment Rental is not included. As the sun sets, you don your dive gear, slip on your scuba mask and bite down on your dive regulator. A deep breath and you step off the boat ? into the underwater night. Although you've seen this reef many times before, this time you drop into a whole new world and watch it come to life under the glow of your dive light. Whether you've never made a boat dive or you've logged dozens, the PADI Boat Diver Specialty course can benefit almost every diver because different boats in different parts of the world do things differently. Diving from a boat is fun, especially when you look at ease when maneuvering around on it. It's fun to know what you're doing. Wanna stay warm and toasty on a dive? Then dive dry. Yes! Unlike a wetsuit, a dry suit seals you off from the outside water and that keeps you warm! Even in surprisingly cold water. Dry suits let you dive more challenging dive sites, and extend your dive season. When you have the right cold water scuba diving attire, you can stand up to the elements and take advantage of the generally better visibility offered by winter months' especially at inland dive sites such as quarries, lakes, sinkholes and caves etc. As a dry suit diver, you're equipped to scuba dive some of the world's incredible dive sites in the world's cooler regions that are best enjoyed in a dry suit even in their warmer months. It is always better to be over-prepared than to forget how to properly and safely complete a dive, and with the new PADI ReActivate™ program, you can quickly brush up on knowledge and skills that you acquired in the PADI Open Water Diver course without having to start from scratch. The PADI ReActivate program is fully personalised and prescriptive, meaning you’ll only have to cover the areas where your skills and knowledge need refreshing. You’ll be able to review important concepts on your computer (ReActivate Online) or mobile and tablet devices (ReActivate Touch) and work through topics at your own pace. It is important to Freedom Scuba to maintain a high standard of Diver Training, and Charter Operation. We have the most qualified Staff you will find in any Dive Shop, and Charter Outfit. Our Divemasters are the best; in the pool and on the Seaway. They have been with Freedom Scuba for a minimum of 5 years, and know Scuba inside and out. Have transportation, be at least Advanced Open Water Certified, and have a flexible schedule.